By all appearances, Zainab Salbi has had an impressive life. Growing up as the daughter of Saddam Hussein's personal pilot, she eventually became a celebrated humanitarian and activist. Yet, as she was helping thousands of women in war-torn countries, Salbi's personal life was coming to a crisis. 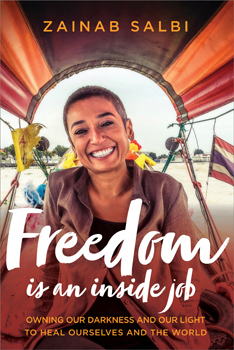 In Freedom Is an Inside Job, Salbi explores her own riveting journey to wholeness - and how embarking on such a journey enables each of us to create the world we want to live in. After years of working as a successful CEO and change-maker, Salbi realized that if she wanted to confront and heal the shadows of the world, she needed to face her own shadows first - and this could only be done by looking within. Through personal anecdotes, real-life stories, parables, and insightful guidance, Salbi takes us through a process of self-discovery. We learn to uncover our hidden motives and desires so we can live in alignment with our authentic values. "As long as we are conflicted within, we will continue to live in conflict without," writes Salbi. "If we want to change the world, we must begin with ourselves."